At our house we have enough extra hex tiles to play a five-person Catan game, but not a fifth set of pieces. Today we printed a new full set of Settlers of Catan pieces, including the knight and city wall pieces needed for the Cities and Knights Expansion Pack and a set of rings to attach to LEGOs to hold a new stack of homemade Cities and Knights flip-cards. 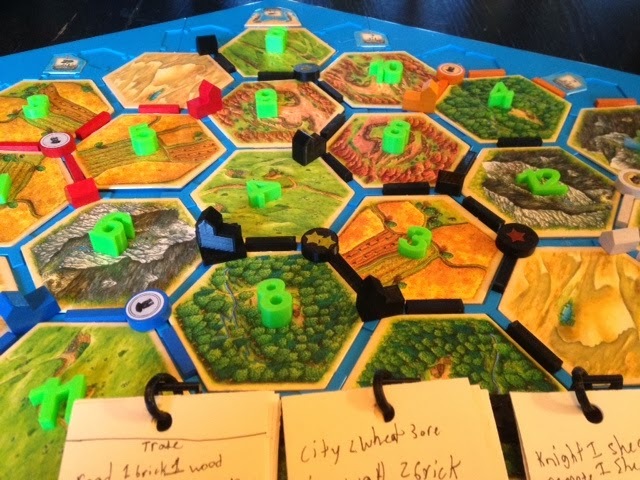 The standard pieces in this print job came from Arcym's Settlers of Catan Pieces model on Thingiverse, and the Cities and Knights pieces were easy to add in Tinkercad. We also threw in a new print of our Catan numbers from Day 42. Settings: MakerWare .3mm/low on a Replicator 2.